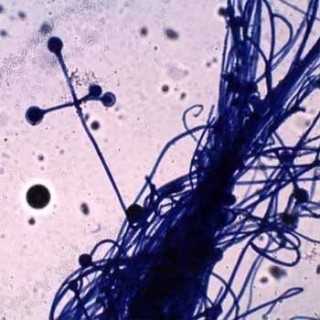 The genus Absidia is characterized by a differentiation of the hyphae into arched stolons bearing more or less verticillate sporangiophores at the internode, and rhizoids formed at the point of contact with the substrate (at the node). This feature separates species of Absidia from the genus Rhizopus, where the sporangia arise from the nodes and are therefore found opposite the rhizoids. The sporangia are relatively small, globose, pyriform – or pear-shaped – and are supported by a characteristic funnel-shaped apophysis. This distinguishes Absidia from the genera Mucor and Rhizomucor, which have large, globose sporangia without an apophysis. A. corymbifera is the only species of Absidia known to cause disease in man and animals. Colonies are fast growing, floccose, white at first becoming pale grey with age, and up to 1.5 cm high. Sporangiophores are hyaline to faintly pigmented, simple or sometimes branched arising solitary from the stolons, in groups of three, or in whorls of up to seven. Absidia is a common human pathogen, causing pulmonary, rhinocerebral, disseminated, CNS or cutaneous types of infections. It is also often associated with animal disease, especially mycotic abortion. The most serious infections associated mycoses is zygomycosis. Zygomycosis is an acute inflammation of soft tissue, usually with fungal invasion of the blood vessels. This rapidly fatal disease is caused by several different species in this class, but rarely cause disease in an immunocompetent host. Some characteristics underlying conditions which cause susceptibility are: diabetes, sever burns, immunosuppression or intravenous drug use. These fungi have a tendency to invade blood vessels. The most commonly isolated species is Absidia corymbifera. It is the only recognized pathogen among the other Absidia species. Some of the other Absidia species are Absidia coerulea, Absidia cylindrospora, Absidia glauca, and Absidia spinosa. Rhizoids are very sparingly produced and may be difficult to find without the aid of a dissecting microscope to examine the colony on the agar surface. Sporangia are small (10-40 um in diameter) and are typically pyriform in shape with a characteristic conical-shaped columella and pronounced apophysis, often with a short projection at the top. Absidia corymbifera is a common human pathogen, causing pulmonary, rhinocerebral, disseminated, CNS or cutaneous types of infection. It is also often associated with animal disease, especially mycotic abortion. A. corymbifera has a world-wide distribution mostly in association with soil and decaying plant debris. The most serious infection associated mycoses involved with absidia is Zygomycosis (further explanation below). Absidia species are filamentous fungi that are cosmopolitan and ubiquitous in nature as common environmental contaminants. They are usually found in food, plant debris and soil, as well as being isolated from foods and indoor air environment. They often cause food spoilage like on decaying vegetables in the refrigerator and on moldy bread. According to the study of Microbiology and Immunology On-line, the Absidia species is one of the three most common genera that can cause Zygomycosis, which also known as mucormycosis; and phycomycosis. Zygomycosis is an acute inflammation of soft tissue, usually with fungal invasion of the blood vessels. This rapidly fatal disease is caused by several different species in this class. The zygomycetes, like the Candida species, are ubiquitous and rarely cause disease in an immunocompetent host. Some characteristic underlying conditions which cause susceptibility are: diabetes, severe burns, immunosuppression or intravenous drug use. Another common health effect of absidia species, is Rhinocerebral infections. This disease is frequently seen in the uncontrolled diabetic. These fungi have a tendency to invade blood vessels (particularly arteries) and enter the brain via the blood vessels and by direct extension through the cribiform plate. Rhinocerebral infections are usually fulminant and frequently fatal. This is why they cause death so quickly. Absidia species may also cause mucorosis in immune compromised individuals. Mucurosis is an infection with tissue invasion by broad, nonseptate, irregularly shaped hyphae of diverse fungal species such as Absedia species. The sites of infection are the lung, nasal sinus, brain, skin and eye (Mycotic Keratitis – infection of cornea which can lead to blindness). Infection may have multiple sites. One species of Absidia which is the Absidia cormbifera has been an invasive infection agent in AIDS and neutropenic patients, as well as, agents of bovine mycotic abortions, and feline subcutaneous abscesses. Absidia corymbifera grows rapidly. The rapid growing, flat, woolly to cottony, and olive gray colonies mature within 4 days. The diameter of the colony is 3-9 cm following incubation at 25 degrees C for 7 days on potato glucose agar. The texture of the colony is typically woolly to cottony. From the surface, the colony is grey in color. The reverse side is uncolored and there is no pigment production. Absidia corymbifera is a psychrotolerant-thermophilic fungus. It grows more rapidly at 37 degrees C than at 25 degrees C. Its maximum growth temperature is as high as 48 to 52 degrees C. The growth of Absidia corymbifera is optimum at 35-37 degrees C and at a pH value of 3.0 to 8.0. Fresenius, G., 1850-1863 Beitr’ge zur Mykologie 111pp, 13 plates. H.L., Br?nner, Frankfurt. Summerbell, R.C., Protocols for Investigation of Indoor Fungal Amplifiers, www.summerbell, 1999.